I had seen these gorgeous dried sunflower heads in photos from the Texas shows and in magazines, but hadn't seen them for sale. But on our way home from St. Louis we stopped at an antique mall and there they were. These monstrous beauties intrigue me with their symmetrical rows of seeds and perfect neutral Fall color. As we move into November and the leaves will soon be off the trees, my decor tends to go to the more neutrals of browns and creams. I transition into Christmas with evergreens mixed into my natural element florals and vignettes; I use less orange, but more browns. I love these little frames from the 40's and 50's. This one has some Harvest graphics. I really love taking photos in the Living Room now that things have been lightened and brightened up with the new painted furniture. Before, even though it was light in here, the dark furniture just "sucked up" all the wonderful light. Hope you're having a fun day and enjoy your evening! come by and check out the rest of the fun! I'm intrigued too! It's so beautiful under glass with your fantastic styling around it. I love the cloches filled with seasonal delights! I only have one cloche, but would love to have more. They're so darned expensive though. Thanks for sharing these beautiful fall decorating ideas. Very pretty vignettes. Esp love the white pumpkin on the urn. All so pretty but those sunflower heads are stunning under the cloche! I love the vintage double photo frame. I have one and now I know what to do with it. I'm so excited! I have some old calendars with some lovely autumn and Christmas pages that I could place inside the frames! Thank you for the inspiration! That sunflower head is a piece of natural art. I love it. Beautiful vignettes, as usual. I have never seen dried sunflower heads...thanks for the intro and maybe I will come home from Texas with some (leaving for the lonestar state tomorrow!!! 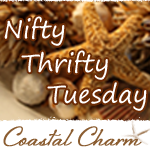 Thanks for sharing all your beauties here at NIFTY THRIFTY TUESDAY!! What a great vignette with that sunflower head, Debra! I love the white pumpkins and the book stack, too. Aren't the Fall fillers great? I love getting the ones that have a nice mix of things in them. Beautiful tabletop vignette Debra! I love the sunflower head inside the cloche. I love how you style everything, Debra! Such pretty cloches! Doesn't everything just look so much more important under glass?!? 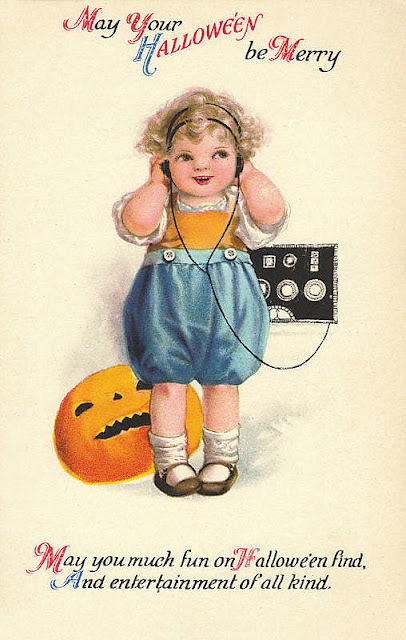 I'm crushing on your wee lil pumpkin trinket box, too. I've got a small collection, but no pumpkins!! that is the most unique flower head. It looks unique under the cloche. Wonderful new header, Debra- Love it- and also your huge sunflower head-it looks gorgeous in the Cloche-and as a part of your beautiful vignette on your table. Your table looks beautiful!! The cloche, books, pumpkins and leaves. The dried sunflowers are awesome!! The cloche filled with the potpourri is very pretty, too! Wonderful job, Debra! Debra, these are beautiful vignettes! Just Beautiful!! My favorite is the sunflower under the cloche! I almost bought a sunflower at the Country Living Fair and I didn't and I have regretted it ever since! The cloches looks so pretty and leave it up to you to take it over the top. The dried sunflower head is wonderful. I had never seen one before and it is perfect under glass. Your living room is fabulous! I am loving the browns and creams. Very soothing, comfortable, inviting, and elegant. Debra, your vignette is just stunning! Love the dried sunflower head! It looks magnificent under the glass and blends beautifully with your decor! Everything looks so calm and serene! Thanks for sharing! Those are simply gorgeous cloches, and I love how you have styled them! I love your sunflower head cloche!!! I so agree about transitioning into the creams and browns. It just seems like the natural transition for November and then by Christmas, I'm ready for some more color. Very pretty indeed. I am smitten with the dried Sunflower head in your glass cloche! "Mr. Ed" grows them here On Crooked Creek...but we always leave them for the birds to eat. The birds make have some rather stiff competion next year! Thank you for sharing this lovely vignette of cloches. Your decor for Autumn with the softer, lighter hues...exquisite! Such a beautiful cloche vignette...the sunflower is beautiful! Beautiful fall vignette, your photos should be in magazines! Happy Halloween from warm Arizona! Hi Debra! 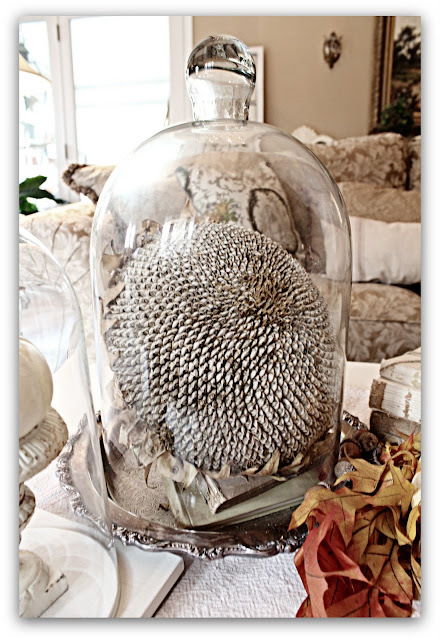 Oh, the dried sunflower head is so pretty and really lights up your cloche! You have so much beauty around you. That sunflower head is SO COOL! I'll be looking for one now! Your Fall vignettes are so lovely Debra. Beautiful photos of such beautiful things. I love getting to see into your beautiful home any chance I get. I am in love with the sunflower head!!! So pretty, Debra! The seedheads are so wonderful, it makes me want to try growing some next year! Debra, Your new header is fabulous! Your fall cloches are GREAT too! I love the cloche on the silver compote and with the sunflower seeds. I have not seen them before. And you are right about how great the light is now in your room. I have to tell you I thought you were crazy to paint your nice wood pieces but I was wrong. They look wonderful. I am crazy about your little white urn since I am partial to urns as much as I like cloches. 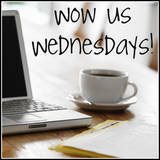 You have just dazzled us today! Very pretty cloche designs! That big sunflower is so unique! So I didn't know this about myself until I came across your post, but I want a sunflower head BAD and will now be hunting for one like mad :D Looks just amazing, and I love how you've decorated for the season. Debra, What a treasure you have in that big dried sunflower head! It fits so beautifully with all your Autumn beauty! I agree with you, this time of year accommodates whites/ browns and naturals! What pretty cloches you got here!Lovely pumpkins and gorgeous fall colours. Thanks for sharing. Debra, I love sunflowers and that dried one is absolutely magnificent! What a treasure! Your living room is just beautiful and each detail is brilliant! Love the sunflower painted white! One year I dried one and it dried in a heart shape. I think I had it for 10 years before it started falling apart. I love your dried sunflower heads! Sunflowers are one of my favorites! So beautiful! I love the pops of orange against your neutral palette! Hi Debra. Your monster sunflowerhead is great and I think the cloche makes it even better! Love your colour scheme. Beautiful. The sunflower is incredible -- it's like something from a natural history museum. I've seen them on blogs but not in person yet. What a perfect way to display it! Love the sunflower seed head in the cloche and the other natural elements. So pretty. OMG! I never seen dried sunflower ever since. You really have a great taste of decorating. I love the cloché with your sunflower in it. What wonderful ideas. I especially love the sunflower!!! Thanks for sharing. love the displays especially the sunflower head, ive never seen anything like that. beautiful! Debra, I have never seen one of those huge sunflower heads before. That looks great under glass. Great cloche displays. Love, love the vignette, specially the sunflower. Lovely.... especially under the glass. Hoping my sunflowers do better next summer. Maybe if they saw your post they'd see their potential! Love, Love, Love the sunflower under glass. It almost looks metallic in some of the pictures. Wonderful and different! Everything is so special under a beautiful cloche. You always do such a wonderful job with your vignettes. Love the dried sunflower!